It’s been just over a week now since the Olympics have wrapped up. I can’t say I tracked the event with any sort of commitment but do admit a love of speed skating of any sort and usually make an effort to watch these events plus women’s hockey whenever I can. I can certainly appreciate the national pride that swells when we Canadians see our athletes do well and compete with a strong ethic of sportspersonship. I saw many print media and social media headlines celebrating what makes us Canadian, in short, what defines us as a nation – the game of hockey. I am concerned. As concerned as I am, I’m not certain what the best and most effective action I can take. Sure, I vote, but sadly the fact that popular vote was not won by the Conservatives in the last election did not make a difference to the outcome. The action taken by parliamentary page, Brigitte DePape was a brave one and drew our attention to the House of Commons where these tragedies are being penned by our elected officials. Others have taken similar creative and courageous actions. 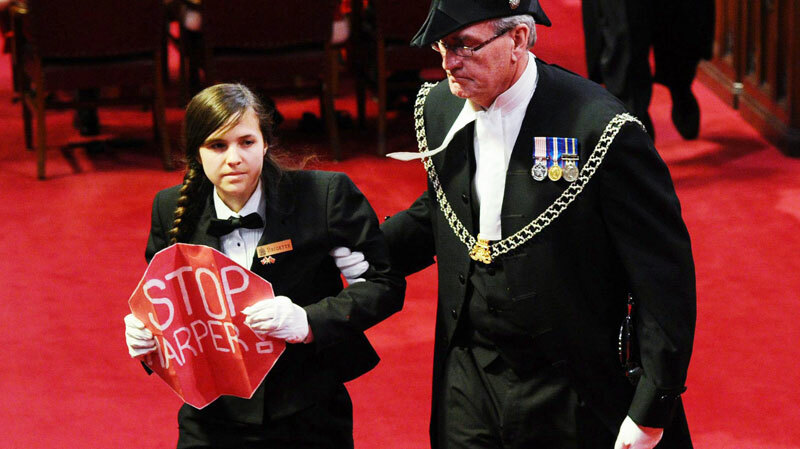 Sean Devlin dressed as a server at a political event where Harper was speaking, to get close enough to the PM to hold up a handmade “Climate Justice Now” sign that was all over the media. Perhaps it’s these creative actions, that grab attention and headlines, that will help get us moving and motivated to care for these issues that are core to our identity as a nation.